All in the timing* – Pamela Wood. As with all things in life, timing is everything in journalism. Showing up at the right moment can mean better interviews, better photos — sometimes an entirely different story altogether. A few weeks ago, I was on the weekend shift and I managed to have great timing twice and terrible timing once. Lucky timing helped me get this photo and a story about a liquor store robbery. First, I was jolted awake at 8 a.m. on a Saturday by a call from the on-duty public information officer from the police department. It was rather early, but I figured he had something good for me. The liquor store was only about 10 minutes from my house, so after a shower and getting my act together, I headed on over. The owner was there, and he already had a crew on site cleaning up the debris. Despite his predicament, he was kind enough to talk with me and let me take pictures. 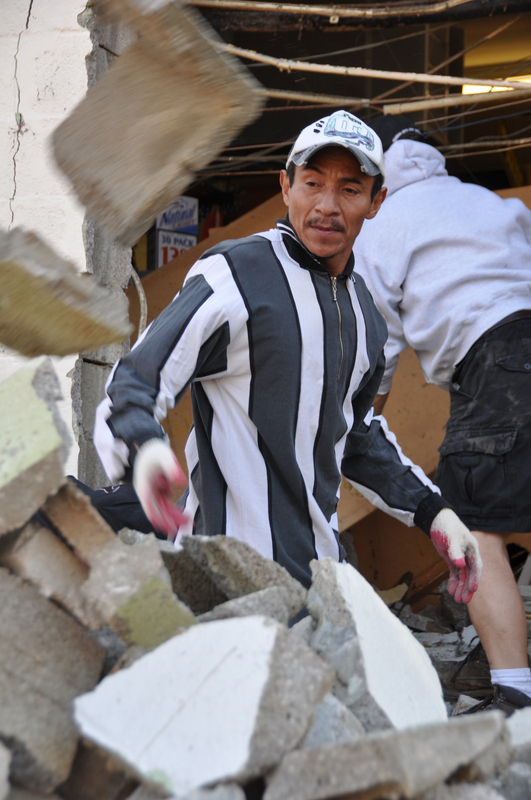 One of my favorite photos of the day was this one to the right, of the worker tossing rubble into a pile. Perhaps it wasn’t the smartest move for me to position myself where I was, but I got a nice picture. I did wise up and move shortly after that, though. 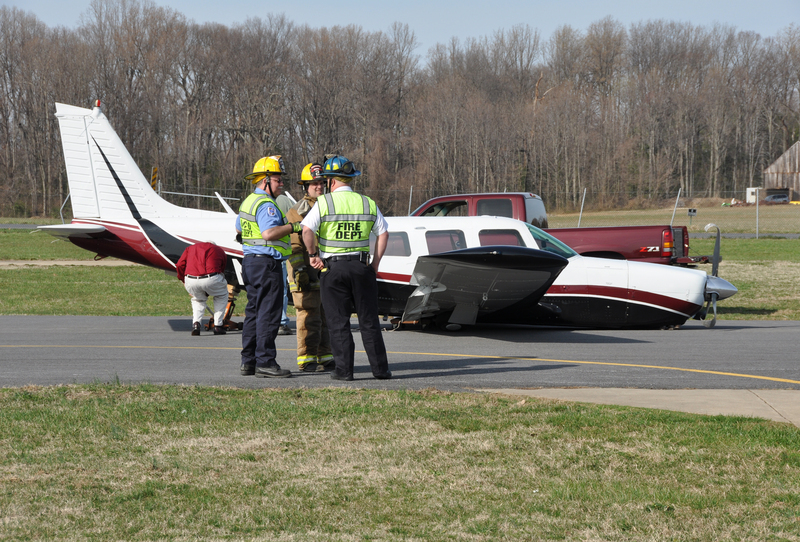 Later in the day, I was heading from an event in south county to a surprise marriage proposal in downtown Annapolis (more on that later), when I got a call from my editor about a possible plane crash at a small airport. Well, lucky me, I was practically across the street from the airport at that very moment. So as soon as the light turned green, I headed into the airport. The crash turned out to be not a crash at all, just an awkward landing. The plane’s landing gear gave way after the pilot had landed the plane. Still, I was able to get a photo of the plane and I later interviewed the pilot by phone. I happened to be right across the street from an airport just after this plane had an unlucky landing. So at that point, I was two-for-two with good timing. But you didn’t forget about that marriage proposal, did you? While I was investigating the non-crash at the airport, I missed the whole shebang down at Annapolis City Dock. The horse and carriage, the dozens of friends and family, the down-on-one-knee bit — I missed it all. But even though I missed the proposal, I still had to write a story. Luckily the photographer made it to the proposal for photos, and I had the groom-to-be’s cell phone number. I interviewed the lucky couple over the phone as they had ice cream. They were sweet and did a wonderful job retelling how the whole thing went down. I would have rather witnessed the event in person, so I could have described the looks on their faces, the cheers of their relatives, and the like. But the timing didn’t work, so I had to do the best I could. It still was a cute little story, but I still wonder how much better it could have been if the timing had worked out. *I borrowed the title of this post from playwright David Ives, whose “All in the Timing” collection was a selection for my fantastic book club.